The South Germantown Recreational Park Community Garden has been a lovely place to grow food this summer – okay, we’ve had some bugs (I’m popping over later today to drown some Japanese beetles, brown marmorated stink bugs, and Mexican bean beetles) and more than our share of fungal diseases and viruses, but we’ve barely had to water, and most of the gardeners have kept up with the rampant weeds pretty well. And there’s lots of produce to harvest, enough that many of us have extra to pass on. Therefore, garden leaders Chris and Latoya decided it was time to have a produce drive to benefit Montgomery County’s Manna Food Center. This past Sunday morning, they set up a donation table and invited all gardeners to stop by and contribute. Later, they dropped the produce off at the Clarksburg farmer’s market, one of several markets to which Manna sends a truck each week (they also accept produce donations at their main warehouse Monday-Friday). 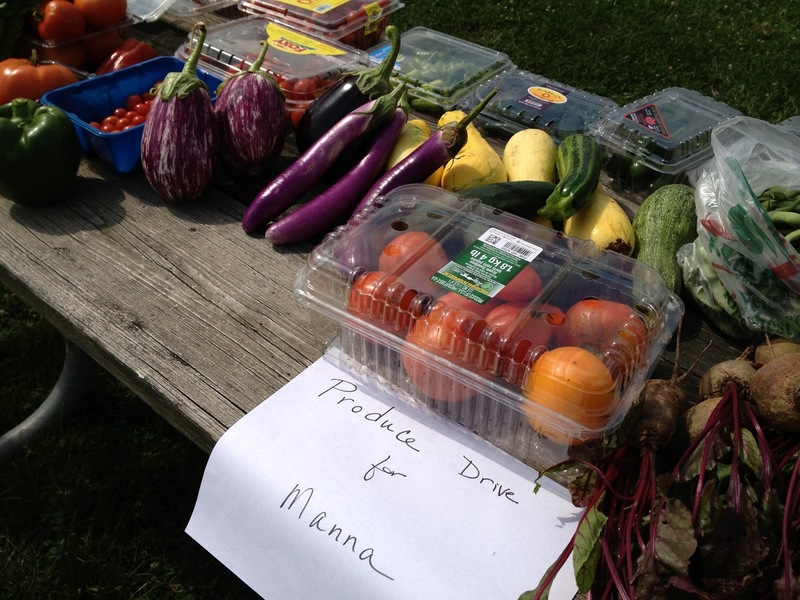 The produce drive (which we hope to have more of) is part of this year’s seed-saving program at Germantown. Several companies donated seeds and seed-saving supplies to the garden, and our job is to pay that back by saving and exchanging seeds among ourselves, and contributing to the community. If you grow in a community garden, or in your own backyard, and have more produce than you can use, contact your local food banks and soup kitchens to see if they can use fresh vegetables. (Many have no storage space, so can only take very small donations if any.) Don’t let good food go to waste when it can benefit someone else! Thanks for visiting and commenting on my blog! You have a lovely and interesting blog, will come back for a second helping some other time.